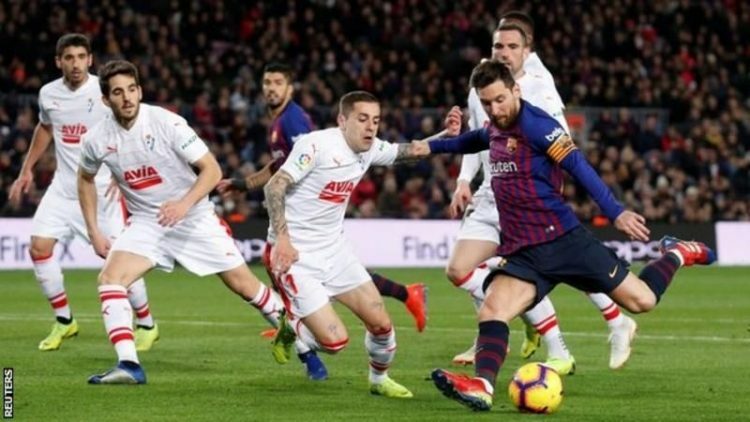 (BBC) Lionel Messi scored his 400th La Liga goal as Barcelona beat Eibar at the Nou Camp to regain their five-point lead at the top of the table. The landmark goal comes in the Argentineâ€™s 435th league game. Luis Suarez earlier put Barca in front by finishing a fine team move before tucking in his sideâ€™s third in the second half. Messi, who becomes the first player to reach 400 goals in one of Europeâ€™s top five leagues, could have scored a second but he shot straight at Eibar goalkeeper Asier Riesgo from the edge of the box. The 31-year-old is only the second player to reach 400 goals across Europeâ€™s top five leagues, following on from Cristiano Ronaldo who has scored 409 league goals 507 games in England, Spain and Italy. It also extends his lead as La Ligaâ€™s all-time leading record scorer with Juventusâ€™ Ronaldo second having scored 311 goals in 292 games at Real Madrid and Telmo Zarra, who scored 251 La Liga goals third.